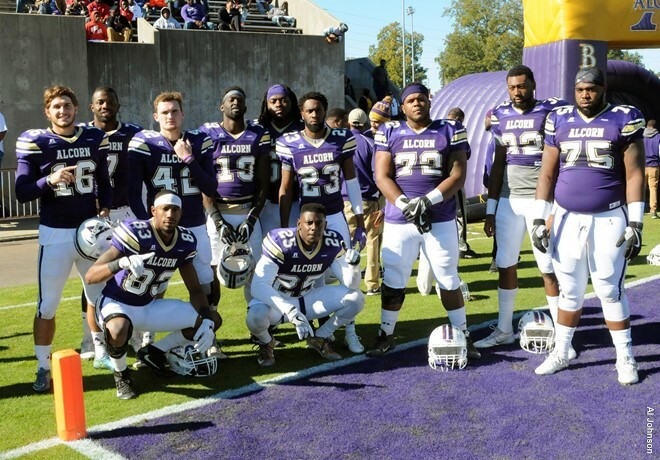 Outscoring Jackson State 21-0 in the second half, the Alcorn State University football program erased a halftime deficit to defeat the Tigers 35-16 on Senior Day in front of a crowd of 27,297 at Jack Spinks-Marino Casem Stadium on Nov. 19. Alcorn (5-5, 5-4 SWAC) trailed 16-14 when senior LaDarrien Davis blocked a punt and freshman Solomon Muhammad picked it up and returned it 59 yards for a touchdown to flip the momentum in the game. The Braves then added on with a pair of touchdown rushes to pull away as the Alcorn defense shut down JSU (3-8, 3-6 SWAC) in the second half. The Braves rushed for a season-high 293 yards. They were led by junior De’Lance Turner who ran for a career-high 129 yards and a touchdown. Freshman quarterback Noah Johnson rushed for 81 yards and a score, and junior Silas Spearman recorded 71 rushing yards and a touchdown. In the air, senior Collins Moore caught a team and career-high 57 receiving yards. Defensively, junior O.J. O’Neal wrapped-up a career-high 11 tackles. Freshman Darrell Henderson notched a career-high eight tackles. The Braves sacked JSU quarterback Jarin Morikawa five times as senior Darien Anderson was in on the action twice. Morikawa ended with 257 passing yards and a pair of touchdowns for JSU. DeSean McKenzie notched 92 receiving yards and a touchdown. The Braves limited the Tigers to just 51 rushing yards in the game. The Braves won their eighth consecutive game against a SWAC East Division opponent. They went undefeated against the division for the second year in a row. Alcorn beat Jackson State for the second straight year after pulling out a 14-10 road victory last season. “It’s big, winning two games going into the SWAC Championship game and having momentum. Our guys have been playing lights out and this coaching staff has done a great job with these young men. The coaches have really been getting on them in order to get them to play the way they are now,” said head coach Fred McNair. The Braves will play either Grambling State or Southern in the SWAC Championship at NRG Stadium in Houston, Texas on Dec. 3. Alcorn is looking to win its third consecutive SWAC Championship. The Braves defeated Southern 38-24 in 2014 and Grambling State 49-21 last season.